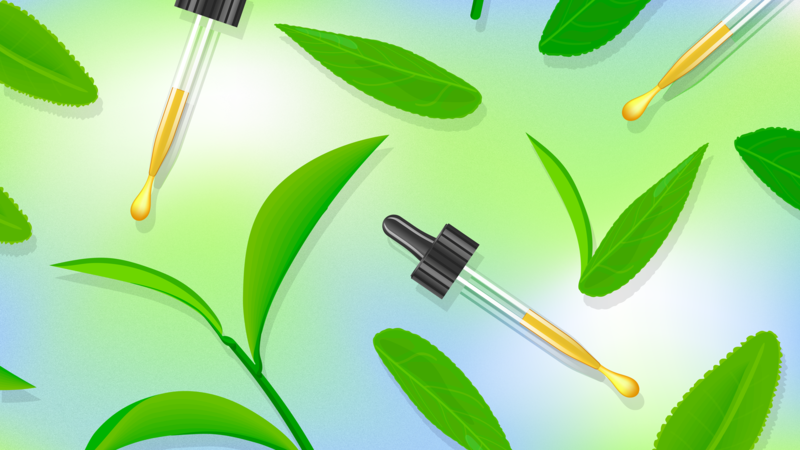 Even if you’re not well versed in the world of natural and essential oils, chances are you’ve read that tea tree oil is an all-in-one ingredient with the ability to fix almost anything. Above all, some swear by it as a fast-acting acne treatment — and as we know, blemishes big or small can be notoriously difficult to remove. Just dab some onto a cotton ball, swipe over your problem areas and voilà: clear skin. But there are way more uses for tea tree oil than just treating acne-prone skin. According to the internet, it can also be used as a detergent, a gargle, a bug repellent… the list goes on! Scroll down to learn 17 unexpected, bizarre and super-practical uses you probably didn’t know existed. Tea tree oil is a super-effective treatment for healing open wounds because it’s antimicrobial — meaning it kills (or at least stops the growth of) bacteria and other potentially harmful microorganisms. TTO is also an anti-inflammatory, so it can soothe redness, swelling and pain. Before applying tea tree oil to an open wound, it’s recommended that you clean it out with some water and hydrogen peroxide. We know tea tree oil is often praised as a highly effective topical treatment for acne. But it can also be used as a topical treatment on your toenails to fight foot fungus. Tea tree oil is known to kill all kinds of yeast and fungi, so you can use it to prevent or treat conditions like athlete’s foot. If you’re hitting the beach this summer, it’s definitely in your best interest to slap on some sunscreen. However, if you still find yourself a little crispy at the end of the day, you can turn to tea tree oil to soothe your sunburn. Its anti-inflammatory qualities help to reduce redness, itching and burning. For this reason, it can be found in a variety of sunburn-soothing lotions. If your home is in desperate need of some sparkle but you’re sick of using harsh chemicals around the house, tea tree oil might be your perfect solution. Combine 10 drops of tea tree oil with two cups of hot water and a half-cup of white vinegar for the perfect natural all-purpose cleaner. However, skip your granite and marble countertops, because vinegar can damage the finish. Researchers at the University of Basel in Switzerland confirm that tea tree oil kills the bacteria colonies that cause bad breath. For an at-home solution, it’s recommended that you use a TTO-infused toothpaste, add a few drops to your regular toothpaste or gargle with a cleansing product that includes tea tree extract in order to achieve fresh breath. According to Reader’s Digest, TTO contains two elements that combat lice. One is 1,8-cineole, a common natural insecticide, and the other is terpinen-4-ol, which is both antibacterial and antifungal. A study out of Italian research university D'Annunzio University suggests that 1 percent tea tree oil can eradicate 100 percent of head lice in half an hour. Tea tree oil contains another 1,8-cineole insecticide known as eucalyptol. Eucalyptol can be used to repel and/or kill many types of critters. If you notice your feet starting to smell, you may have athlete’s foot or another fungal infection. Luckily, since TTO has antifungal properties, you can use it as a topical remedy to treat any fungal skin conditions. Treating fungus, in turn, can help to stop odorous feet. A common cause of dandruff is the overgrowth of Malassezia, a fungus that lives on the scalp. Since tea tree oil is known to be antifungal, it can kill or prevent the growth of Malassezia, thereby curing dandruff. Due to TTO’s anti-inflammatory properties, it is extremely effective at reducing swelling, itching, burning and redness (all symptoms of insect bites).To treat your bug bite with tea tree oil, apply a few drops to a cotton ball, and press it onto the affected area so the oil can fully absorb into your skin. Applying a bandage afterward will ensure that the oil doesn’t evaporate, giving it the chance to do its job. If the apartment is starting to smell funky but you aren’t into chemical sprays, we recommend going all-natural. Mixing tea tree oil, eucalyptus essential oil and lemon essential oil makes for a delicious-smelling combo that can be sprayed in every corner of your abode. We’ve already told you (a million times over) about TTO’s bacteria-fighting properties. Who knew they’d be so versatile? Another way they come in handy is by refreshing your musty-smelling laundry and giving your detergent a little extra cleaning boost. It’s basically a natural disinfectant for your clothes. Tea tree oil’s intense fungus-killing abilities make it the ultimate killer of mold and mildew. Combine it with water and spray it on affected areas before wiping it away to permanently eradicate the gross stuff from your hard surfaces. We’ve said it before and we’ll say it again: tea tree oil is antifungal. Plus, it’s an all-natural insecticide. Do you know what that makes? Happy plants with a critter-free habitat to grow in. Tea tree oil is extremely effective at breaking down makeup, so it’s a perfect natural addition to your bedtime routine. Be super-careful around your eyes and mouth. After applying TTO to the skin, rinse off with some warm water and swipe on a toner. Tea tree oil’s antibacterial properties definitely come in handy when tackling those pesky cold sores. But before applying it directly to the sore, dilute it with a carrier oil (such as coconut or olive oil) so you don’t damage your skin! Sometimes, clogged hair follicles on the scalp can mean shedding… and lots of it. If you’re noticing significant hair loss, try applying tea tree oil to cleanse your scalp. It’ll likely unclog your follicles and kill any harmful fungus or bacteria that’s preventing the regeneration of your hairs.